Garden tractors are built to satisfy demanding needs, and if cared for properly they will provide you with decades of reliable use. This is why maintenance should never be overlooked or taken lightly. The good news is that you do not necessarily need to possess the skills of an expert mechanic in order to keep your unit running in top condition. Let’s take an in-depth look at some of the most important maintenance tips so that you will be prepared for any eventuality that might arise. By their very nature, tractors will be dealing with a great deal of vegetation. These materials can easily become embedded within the undercarriage. This could result in mechanical problems and in severe cases the discharge chute (if one is present) may even become clogged. It is obviously much easier to periodically clean away a small amount of debris as opposed to waiting until the tractor begins showing signs of trouble. In order to be completely safe, make certain that the power is off before examining the undercarriage. Tractor blades endure a good deal of wear and tear during each gardening season. They are regularly pelted with rocks, sticks and other types of debris. As a result, even hardened steel tends to dull over time. A dull blade can make cutting the grass a real chore. This is even more problematic if larger weeds need to be removed. Although you can sharpen the blade manually, it could be a good idea to remove it and take it to a local repair shop for the best results. All spark plugs have a limited lifespan; especially if you are using your garden tractor on a regular basis. It is always a good idea to replace the spark plug every year (preferably at the beginning of the season). Remove the wire attached to the top of the plug and remove it with the use of a socket wrench. Be sure to bring the old plug with you when purchasing a new one so that a similar model can be selected. If you are ever in doubt, check the owner’s manual. There could be a specific make or model that is recommended. As you can imagine, the air filter attached to a garden tractor will have to deal with massive amounts of dirt and dust. It will therefore need to be cleaned out and repaired occasionally. If you notice that you are burning through gas much faster than in the past, the chances are high that there is an issue with the filter. The majority of tractor filters are made of paper and they are simple to replace. Still, be certain that you purchase the right size and that is designed to deal with the horsepower associated with your unit. Many will argue that oil levels are the most important maintenance concern associated with any garden tractor. If not enough oil is present, you will place excess wear and tear on the moving parts within the engine. Not only should you monitor oil levels on a monthly basis, but check to make sure that no debris has collected on the surface. It is also wise to change the oil every year. Most tractors will have a plug located somewhere on the undercarriage. Consult the manual for additional instructions as well as to know which type of oil should be used. Much like the oil, examine the gasoline to be sure that no dirt or debris is present. Foreign substances can easily clog the fuel line; causing the tractor to shut down. You should also completely empty the gasoline tank at the end of every season. If it is allowed to sit, the inner workings of your tractor can be negatively affected. This quick check is therefore a lot cheaper and easier than buying a whole new tractor. Always start each season with a fresh tank of gas. You do not need to possess a great deal of technical knowledge to apply grease to any visible fittings. Grease is essential if you hope to prevent excess wear within areas such as the struts that support the wheels. Keep in mind that some of these fittings might not necessarily be visible to the naked eye. Refer to the owner’s manual to make sure that you address them all. The manual should also inform you about the recommended type of grease (there are different formulations). In order to access hard-to-reach locations, attach a hose to the grease gun. To be safe, the grease should be checked and refilled every time you change the oil. Garden tractor tires will inevitably suffer leaks from time to time. If you happen to own a unit with tubeless tires (this is the most common), you will need to examine their condition every few months. You might be surprised to learn that many leaks are caused by corrosion around the rim as opposed to punctures. You can try to apply sealant to the outside, but the chances are high that the problem will persist. It is often easier to head to the repair shop and order a replacement tire. Many tractors have cabins that are exposed to the elements. Rain, humidity and changing temperatures can all have an impact upon this area. First and foremost, keep the tractor covered when not in use. If you do not own a shed or garage, a tarp can provide moderate levels of protection. Also, examine the seat for any signs of cracking. It is a good idea to purchase a spray-on UV treatment so that the surface is not directly exposed to the rays of the sun. In terms of gauges, keep an eye out for any moisture underneath the lenses. If this is present, a seal has likely ceased working properly. Purchase a replacement, as rust can quickly cause gauges to lock up. Before attempting this, check your warranty. You might otherwise void the services could be offered at no charge. Modern ride-on garden tractors are equipped with a number of safety features. It is important that you make certain they are all functioning properly. Examples can include any handles that disengage the blades when released and pressure-sensitive seats that cause the motor to immediately stop if the driver stands up. As such systems can help to prevent serious injury, they need to be working properly. Take the tractor to a mechanic if you find any faults. Certain types of tractors may require more timely maintenance than others. This is often stated within the manual. Most units should be examined between every 25 to 50 hours of use. Read the care instructions carefully in order to adopt the proper schedule. Never forget that a bit of preventative maintenance today can save a massive headache tomorrow! This is actually the same maintenance advice that car owners should follow. Take a walk around the garden tractor before each use. Look for any visible signs of damage such as scrapes, rust or tire imbalances. If your tractor is equipped with brake lamps or headlights, make sure that they are all functioning as they should be. Many owners choose to purchase a set of spare bulbs in the event that an existing unit suddenly burns out. This can help save a trip to the local repair store. This is often the top recommendation found within many online advice columns, and for good reason. Attempting to perform maintenance tasks without having a working knowledge of your garden tractor is a sure-fire way to cause additional problems that could have otherwise been avoided. Pay particularly close attention to the safety section as well as any suggestions recommended by the manufacturer. In the same respect, highlight any procedures that might void the warranty of a new unit. When in doubt, call the supplier in question to determine what should be done next. 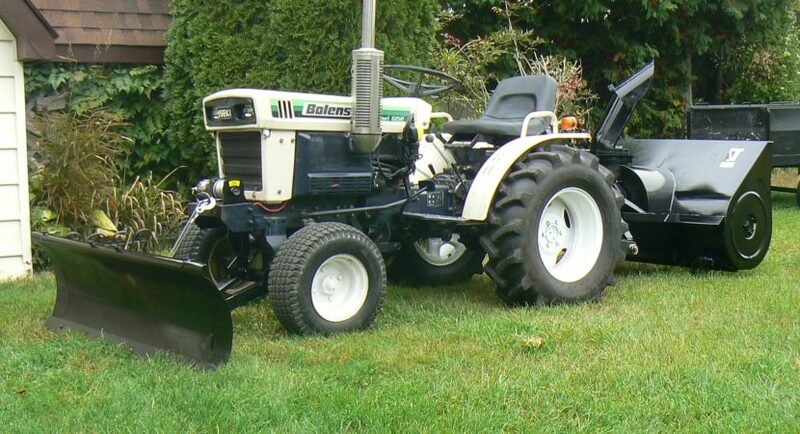 Even the most well-maintained garden tractors will need a tune-up from time to time. Most experts recommend that you visit an authorized repair service at least once during the first two years of ownership. As the tractor begins to age, yearly check-ups are the best way to make sure that small problems are identified before they evolve into major issues. If you take a proactive stance in regards to tractor maintenance requirements, years of reliable results are virtually guaranteed.